With the long break between seasons, it feels like forever since we discussed some Arrow. I was eager for tonight’s episode and just as eager to jot down my thoughts. I heard from a reliable source that that a number of NFL teams have called Ollie to inquire about the status of Curtis after displaying his arm strength by throwing the T-Sphere to chase down that rocket. What a cannon! Overall, I thought the episode was all right. Truthfully, I was hoping for a bit more in the season opener. There were some recurring themes that I was hoping wouldn’t make the cut coming into season six. One such theme is more of a storytelling device/narrative and on the “technical” side of the production process: the flashbacks. 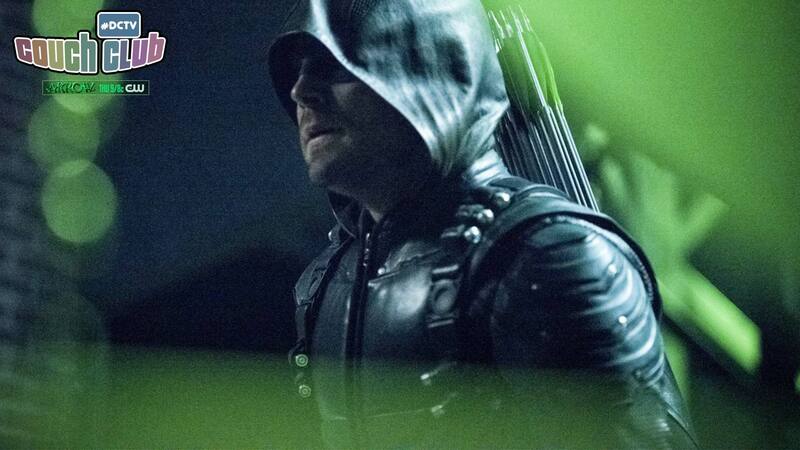 I know it’s one of Arrow’s trademarks, but I felt that season five had brought the show completely full-circle with Prometheus going back to the island where everything started for Oliver. To me, that would be a good place to put the flashbacks to rest. Granted, the flashbacks tonight weren’t to Ollie’s past like we’re accustomed to. I just would have preferred that tonight picked up with them still on the island and moved forward in a chronological order to where they are now in the present rather than jump back-and-forth. Last season ended on such a great cliffhanger that you wanted to see how the characters would get out of the jam they were in. Opening tonight with all the team safe from the island danger and fighting in the present (presumably months after getting out) kind of took away that momentum that last season ended with and the anticipation you had coming into this season. Also, the storyline carrying over that I was hoping would be done is the relationship Quentin seems to have with bad Laurel. At first, I really liked this dynamic. I thought it was a cool angle—what father wouldn’t struggle seeing someone you believe to be your dead daughter? It would play major head games with you. However, as time went on, I felt like Quentin’s obsession with this made him one-dimensional. The more we see him struggling with the same thing over and over, the more it kind of loses its effect. He either needs to accept the idea of parallel Earths and that’s not technically his daughter, or get out of the way. But maybe his persistence is the show hinting at something? Who knows… Honestly, I’d like to see the parallel Earth version of Quentin. He’s probably clean-shaven, sober and has a good attitude. There were actually a number of things I really liked tonight, starting with the new character. I also like this developing issue we’re seeing with John not being able to fire his gun or hit a target. We’re obviously seeing the tip of the iceberg with this issue and I’m curious to know what exactly is going on. Although, I was a little confused…after the attack on Ollie’s hideout, Dinah tells John she found his gun and it wasn’t fired…but I thought he fired it multiple times and missed the guy. Maybe I’m the one who missed something. Last, but certainly not least, my favorite part of the episode came in a scene that lasted only a few seconds. Who was the mystery man stepping out of the helicopter to revive bad Laurel? He obviously has some serious powers to be able to bring someone back who appeared to be dead. Maybe this mystery man will be this season’s new villain? Whoever it is, the teaser was great and has me wanting to know more!